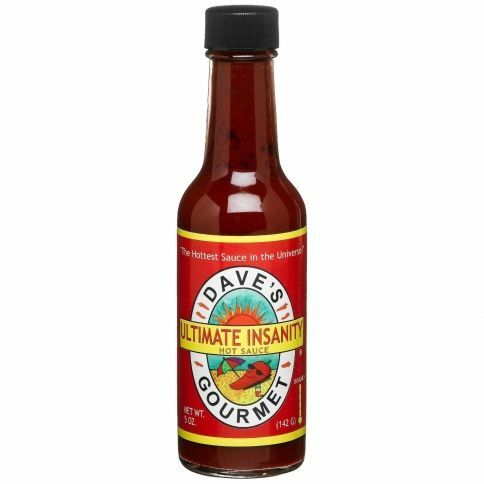 Friends of fiery foods rejoice - Dave's Ultimate Insanity Sauce is also available in Europe. This sauce, that's been also used as a bear repellent, makes your tongue twist and breathing difficult, and your nose and eyes to leak. If your hottest experience is Tabasco or Jalopeno, the Ultimate Insanity Sauce will blow your mind to a whole new level. Infernal hotness in a bottle - Even the Devil can't handle this stuff undiluted. And then the compulsory warnings: Don't eat this into an empty stomach. Don't ever eat a whole drop with the purpose of tasting unless you've already tasted a smaller amount previously. Never give this bottle to your children - or do pranks to your friends. If you insist on trying the Ultimate Insanity raw, dip a small stick like a toothpick into it, and try it with your tongue. We guarantee the taste won't go unnoticed. So back to the business: Dave's Ultimate Insanity sauce is a pimped up version of the Insanity Sauce, that was the first sauce banned from the American National Fiery Food Show. In it's fieriness it was rated above all tolerances the jury could expect, and this Ultimate version is even hotter. If we're to grade it, the Ultimate Insanity Sauce scores 250000 SHU points (Schoville Heat Unit), whereas the Insanity Sauce gets 180,000 SHUs. Let's just mention that Tabasco and Jalopeno score around 2500-5000 SHUs.